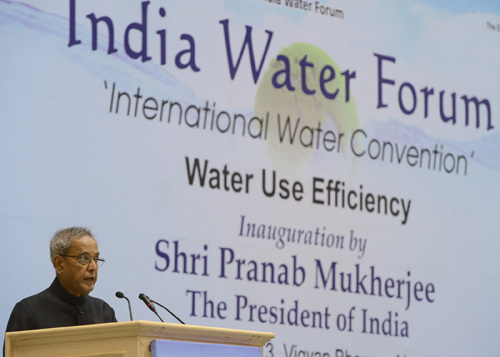 It is indeed a privilege for me to be present amidst you this morning and to participate in the inaugural session of the Second India Water Forum. At the outset, let me congratulate The Energy and Resources Institute (TERI) and the other supporting partners – the Ministries of Urban Development and of Drinking Water and Sanitation in the Government of India and the Water and Sanitation Program of the World Bank – for organizing a programme of true global relevance. I am happy to be given this opportunity to address this distinguished gathering of water sector experts, researchers, academicians, policy makers and students. Leonardo da Vinci had once observed and I quote: "Water is the driver of Nature” (unquote). In India, water evokes reverence in people. It is given the status of an incarnation of God, ‘Varuna’, who is worshipped as the god of all forms of the water element. India is home to seventeen per cent of the world population. However, it possess only four per cent of its renewable water resource. Population expansion,rapid urbanization and developmental needs have exerted tremendous pressure on India’s water availability. From 1,816 cubic metre in 2001, the per capita availability of water has reduced to 1,545 cubic metre in 2011. It has been estimated that it will further reduce to 1,140 cubic metre by 2050. Water security, which already is a formidable challenge, is going to aggravate in the future. As we grapple with diminishing water resources and escalating water demand, water use efficiency holds great promise. In today’s context, the saying "water saved is water generated” is truer than ever before. This Conference, by focusing on water use efficiency, will help to bring this important issue to the forefront of policy discourse. The National Water Policy 2012 recognizes the need to improve efficiency in the use of water resources. The improvement of water use efficiency requires innovative tools of promotion and incentives for efficient water utilization. At the same time, it calls for dealing with inefficient water consumption through disincentives and stricter regulation. In the past, focus was laid primarily on augmenting the quantity of water available without giving due attention to the manner in which the water will be used or managed. A paradigm shift from ‘water resource development’ to ‘integrated water resource management’ is now necessary. For that, the existing institutions involved in service delivery have to be restructured and strengthened. The threat of climate change is real and contemporary. By altering river flows, decreasing groundwater recharge, intensifying floods and droughts, and allowing salt water intrusion in coastal aquifers, climate change can severely affect water resources. This challenge has to be met by efficient water management. As part of the National Action Plan on Climate Change, the National Water Mission was launched in 2011 with the objectives of water conservation, minimization of wastage and equitable distribution. One of the most important goals of the National Water Mission is to increase water use efficiency by twenty per cent. Historically, agriculture has been the biggest consumer of water in India. But due to unprecedented urbanization, urban water demand has compelled the shift of water resources from rural to urban consumers creating an inter-sectoral rivalry. With the sources of water remaining unchanged, this inter-sectoral competition over allocation of water is likely to rise in future. Addressing this situation calls for efficient allocation of water between various sectors. Our country’s agriculture is a big demand centre for water. Water management in this sector is therefore crucial for overall sustainability of our water resource. The 3 R strategy of reduce, recycle and reuse has to find application in our farmlands. Our irrigation system has to encourage judicious use of water. Our efforts at recycling and reuse of wastewater have to be doubled. India has to also learn from countries like Israel where effective water policies and technological advances have led to water use efficiency in agriculture.The decreasing ground water level has to be contained by resorting to improved water use technology and better management of aquifers. Rain water harvesting has to be popularized by dovetailing existing rural development schemes like Mahatma Gandhi National Rural Employment Guarantee scheme. Our initiatives at integrated watershed development have to aim at increasing the soil moisture, reducing the sediment yield and improving water productivity. Usable water is a scarce commodity. The pricing mechanism has to act as an incentive for saving and disincentive for wastage. The role of water users associations has to be strengthened by giving them adequate powers for collection of water charges and management of the water distribution system. The provision of safe drinking water has become a serious development initiative around the globe. There is a significant portion of humanity which remains denied of access to this basic necessity. The reach of the poor to safe drinking water has to be enhanced by developing mid-market technologies that can deliver affordable water treatment devices. Micro finance institutions have to be engaged to acquire devices and encourage shared access to safe drinking water. The current legal framework pertaining to water in India is non-uniform and inadequate to deal with the complex water situation. A broad over-arching national legal framework of general principles on water could pave the way for essential legislation on water governance in the country. Concerted effort is also required to make the water sector policies and regulations clear, coordinated and comprehensive. Only then can India hope to mitigate the impact of the looming water crisis. I am aware of the good work being carried out by TERI in the water sector. With the expertise that TERI commands in areas like integrated water resources management, climate change, and domestic and industrial water management, I am happy that it has chosen to take the lead in organizing this event. I am most certain that this three day Conference will witness comprehensive and dispassionate deliberations on various aspects of water use efficiency, which will help to develop a consensual understanding on water use management. I hope that this convention will showcase advanced knowledge and successful technologies developed in different countries and promote international knowledge exchange for addressing challenges related to water security. I wish the organizers the very best in successfully conducting this conference. I also wish them all success in their endeavours.